The Raptors' biggest issue has always been the greatness of LeBron James. And due to the comfort with which the Cavs star has dispatched of them thus far, it doesn't look like that'll change anytime soon. 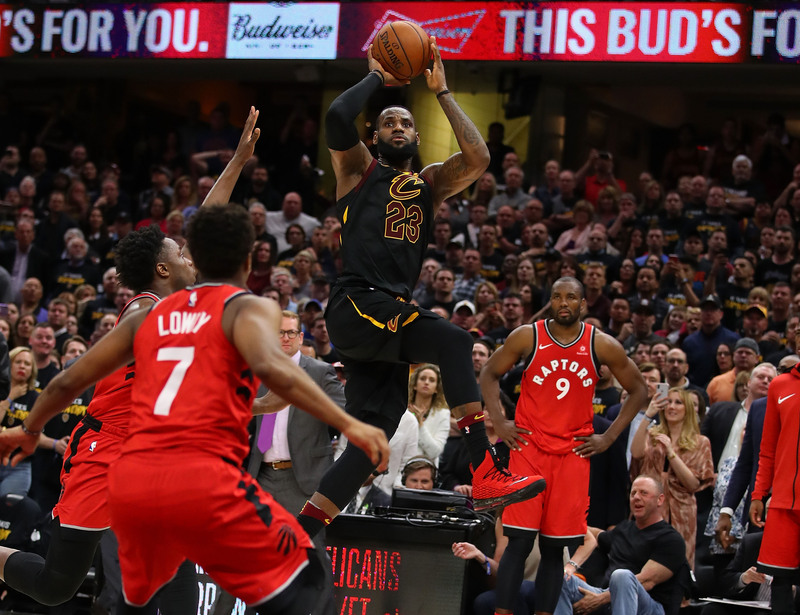 The problem for the Raptors, as has long been the case, is that LeBron James is beyond them. O.G. Anunoby has fared as well against James as a rookie possibly could, and yet none of his best efforts have meant a damn thing. Pascal Siakam is active, long, and in over his head—an energy player made to sit down and play chess against a master of situational strategy. These are the best options Toronto has to check LeBron. In their combined possessions matched up against him, according to NBA.com, James has scored 89 points on 55% shooting from the field, racked up 30 assists, and committed a total of three turnovers across three games. Toronto has tweaked and adjusted to no real end, save that they lost two games—in what is now a 3–0 series in Cleveland's favor—by the slimmest of margins. Those missed opportunities are the sort that can haunt a franchise. They can lead to trades and firings, bringing an era to its end. And yet James stole away both of those games almost casually, because the Raptors still do not have the means to take anything away from him. Toronto, it seems, is LeBron's comfort food. The ease of it all suggests a sweep. For as close as this series has been (excepting the aberrational blowout in Game 2), the entire affair has been defined by Cleveland's ability to get whatever shots it wants. James sees the full menu on every possession and chooses according to preference. At certain junctures, it becomes a priority to establish Kevin Love. At others, James calls for Kyle Korver to set a ball screen—mucking up Toronto's carefully tailored matchups. There are so many paths to efficiency that LeBron has needed only to choose between them. That sort of elective offense has worked wonders. With James on the floor—as will be the case for as long as necessary in any competitive game—the Cavaliers have scored 114.6 points per 100 possessions in this series, per NBA.com. That mark is higher than any regular season offense on record. Cleveland still isn't a solvent team without James in the lineup, but this series has shown the power he can draw from even moderate functionality. Kevin Love isn't shooting a great percentage for the series, but he's finding openings beyond static, spot-up jumpers. George Hill's box score output might seem meager, but having another stable ball-handler on the floor (and one whom James actually trusts, at that) makes all the difference for the Cavs. Every possession that Hill initiates allows James to take a temporary backseat. Every minute he plays means one fewer for Jordan Clarkson, who has been horrid throughout these playoffs. Every entry pass Hill throws into the post is a reminder of how difficult the simplest tasks seem to be for Cleveland's role players, and how noticeably Hill raises this team's baseline competence. In a series like this one, that's all that James really needs. To put the ball in LeBron's hands for a single possession remains one of the best value propositions in basketball. That alone can dominate a series, provided that Cleveland gets even occasional stops and pieces together enough scoring in the aggregate to stay afloat. The Raptors, thus far, haven't managed a sufficient challenge on either front. Manufacturing a good look for the supporting Cavs shouldn't be as simple as running DeMar DeRozan around a few screens or picking on C.J. Miles. So long as it is, James will be able to pace himself for as many high-leverage plays as Cleveland needs. That freedom is an indictment. The Pacers never allowed the Cavs to pick their spots; they applied enough waves of pressure that Cleveland often had no choice but to funnel its offense through LeBron, no matter the circumstances. Even when James was exhausted and saw layers of help defense waiting, he had little choice but to attack. The Raptors have yet to make James press in the same way. For all the crunch-time possessions in this series, very rarely does James seem to create any shot other than the one he wants. He might take a turnaround, fadeaway jumper just because, or explode off the dribble in a way that leaves the defense helpless. Both are choices. And both, in a way, express the same sort of dominion.